CHARLESTON, S.C. — South Carolina may well have a reputation of fueling political grudges borne out of decades of dirty politics. But when former U.S. Rep. Beto O'Rourke traveled here Friday and Saturday, the message from the locals could not have been more emphatic: They want to defeat President Donald Trump in 2020, and they have no interest in sour grapes from also-rans. It was a message the candidate was already selling. "Come summer of 2020, we'll all be on the same team," said O'Rourke in his introductory remarks at a Saturday morning town hall, his voice hoarse from more than a week of nonstop campaigning. "We will all be behind the same candidate." South Carolina has a long history of racially based mudslinging in both the Democratic and Republican primaries. It is also one of the most pivotal places in the country for presidential candidates in both parties, but perhaps especially for O'Rourke. The state's anticipated Feb. 29 Democratic primary will be the last of the first round of state contests next year. Whoever places well in South Carolina will head into the March "Super Tuesday" contest — a rash of states that will include Texas — with momentum. While O'Rourke heard the usual policy questions from cycles past about health care and education, the Democrats in Charleston were less interested in splicing O'Rourke's platform and more focused on political strategy, a line of questioning that implicitly recalled the party's 2016 loss and the resulting Trump administration. After losing to U.S. Sen. Ted Cruz last year in Texas, how did he plan to win the Electoral College if he is the party's nominee? And if he is not, would he promise to fully support the eventual nominee? With a second Trump term on the line, it was a display of radical political pragmatism on the part of these voters. And O'Rourke concurred with their anxieties, promising that the party would come together and that his experience campaigning across Texas prepared him for a nationwide campaign. 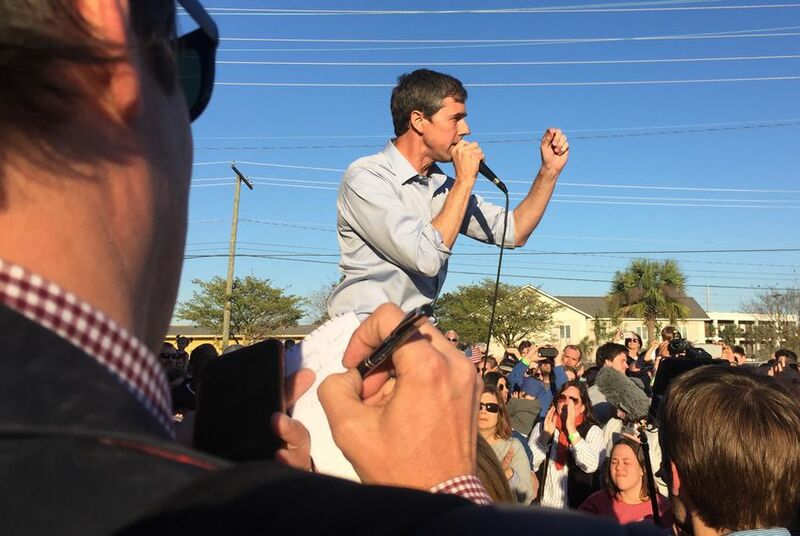 The high school gym where O'Rourke spoke to hundreds of people for nearly an hour sat in the shadow of the football stadium of The Citadel, the nearby military college. Just a short walk from where several rivers drain into the Atlantic Ocean, O'Rourke's praise of local U.S. Rep. Joe Cunningham for "ensuring that we do not have offshore drilling right here in this state" — brought the crowd to its feet, as did his connecting the area's flooding issues to global warming, urging the South Carolinians to "meet the existential challenge of climate change, whose effects we are already experiencing here in Charleston ... every time it rains." And just a mile and a half away from the Mother Emanuel A.M.E. Church, where an unrepentant racist shot and killed nine African-Americans, he drew a similar enthusiastic response in declaring his support for gun control. Also on the voters' minds here was the issue that always dominates South Carolina politics, particularly in Democratic primaries: race. "Given the fact that African-Americans make up 55 percent of the Democratic voting bloc here in South Carolina, why should black people vote for you?" a woman asked at the town hall. "As a white man in this country, it is only belatedly and only in part that I begin to understand the struggles of others," he responded. O'Rourke then fleshed out his views on criminal justice, the mortality rates of women of color and drug enforcement policy. Shawn Johnson, an educator and immigrant who attended the event, said he had close friends who were murdered in the church shooting. He praised O'Rourke's tone toward African-Americans. "We're here. ... We came out to see him and to support him because I think he [speaks] truths about who we are and what we need as a minority group in Charleston," Johnson said. Sagid Elhillali, an engineer wearing a T-shirt sporting a likeness of U.S. Supreme Court Justice Ruth Bader Ginsburg and her initials, said he remains on the fence over whom he will support for president next year but that he was leaving the event leaning toward O'Rourke. "I think that's really important to me that he's recognizing that, yeah, there is a lot more people than white males in America," Elhillali said. As it had been earlier in the week in New Hampshire, the reception to O'Rourke in South Carolina was boisterous. Hundreds of people showed up at both Charleston events, which marked the end of his first swing through the state. The atmosphere was reminiscent of his Senate run. Vendors posted up outside of both events to sell shirts and hats emblazoned with the black-and-white "Beto" logo. O'Rourke drove himself into the brewery parking lot in his signature minivan. And his dutiful spokesman continued to livestream each event to social media. But not everybody gets a selfie with O'Rourke anymore. The crowds are more intense. His schedule is busier. His in-state staffers are more brusque. On Saturday morning, the congressman had to dash out to make a flight to Las Vegas for a round of events out west. Instead of a lingering crowd, the gym emptied out rather quickly, and it was a local state senator who was the selfie photo draw. Beto O’Rourke's campaign received 128,000 "unique contributions" in the first 24 hours.